There are dozens of events on offer as part of the Sapphire Coast Science Festival. Science is on the menu again on the Sapphire Coast this August to celebrate National Science Week 2016. Running from Saturday 13 August through to Sunday 21 August, the week begins with a community celebration at the new Tura Library. All are invited to share the launch of a new app and recording platform for the Atlas of Life at this event where you will discover how to edit film footage from the Great Barrier Reef. Enjoy the fun and finds from the last few years as the region’s Atlas of Life grows to now over 12,000 records of local species. Get help to download the new app and help add your own animal sightings. Come and use our great new microscope to see creatures up really close – a butterflies’ wing, ocean plankton, or bring your own specimen to study. Lots of new things to see and try and nibbles too. The week of science continues with Scinema, the international festival of short science films. These are interesting and relevant films that are good for scientists and non scientists alike. Those who want to get muddy and go on a frog hunt can enjoy the popular Panboola Frogwatch. Or why not celebrate local Indigenous science with a walk and talk on the newly developed section of the Bundian Way? Throughout the week the Sapphire Coast Marine Discovery Centre will run hands on science experiments and activities for visitors of all ages. Just come in and get hands on with slime, water currents and much more. On Friday 19 August you can test your trivia knowledge at the RSPCA trivia night. The night is only $15 per person with tables of 8. Enjoy a great night out to getting quizzical with lots of prizes to be won. Starts at 7pm and all proceeds for the night go to the Sapphire Coast Volunteer Branch of RSPCA NSW. Tickets available from Club Sapphire, call 026495 1306 to book. The week flies high on Saturday 20 August with drone and quadcopter demonstrations at Panboola wetlands. Watch them fly and learn how these fun things work and are used in scientific research. The week ends with robotics and a bang. Come along to the science expo at the Bega library for science displays from local school students and amazing hands-on robotics workshops (bookings essential) presented by a talented group from Narooma High School. And everyone will enjoy the shows presented by the wonderful, explosive Dr Graham, the Science Show off who has entertained the whole community with fantastic science performances for a number of years. A fun filled week not to miss. For more information and bookings visit www.atlasoflife.org.au. 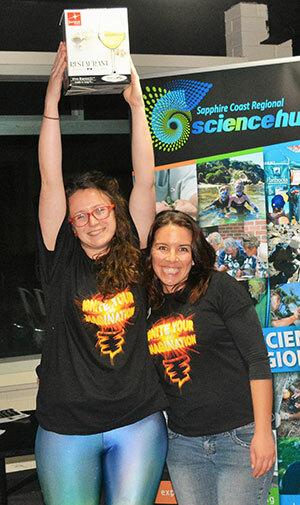 You can also find the Sapphire Coast Regional Science Hub on Facebook. Jillian Browning is the Marine Education and Events Coordinator at the Sapphire Coast Marine Discovery Centre and co-convenor of the Sapphire Coast Regional Science Hub.